18" Tall x 16" Wide x 20" Long. Stackable. 1/2 hp. - 2 speed blower motor w/ 15' electrical cord. Primarily designed for the underside drying of wet carpet. Great for moving air over wet floors to reduce drying times for newly waxed floors. 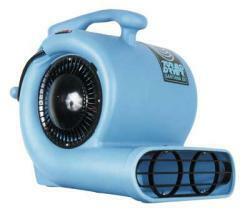 Greatly reduces the chance of mold spores forming when used in conjunction with dehumidifiers. * Please call us with any questions about our carpet fan dryer rentals in Oak Grove MO, Blue Springs MO, Independence MO, Lexington MO, Odessa MO, Independence MO and Western Missouri.